An earlier article told the first half of the story of Spencer Square in downtown Rock Island — how the square block between 19th and 20th Streets and Second and Third Avenues was given to the city for public use, and how it was converted from a weedy swamp in the 1850s to an elegant formal park that was dedicated in 1890. But it is now time to continue the saga of Spencer Square. At first glance, our circa 1910 postcard showing the center of the park looks like the one we published last October. But there is one difference — a “new” bandstand. In 1904, plans were announced to build two bandstands, a new one in Long View Park and a “better” one to replace the original 1880s structure in Spencer Square. Otherwise, the picture looks no different — the same magnificent Cable fountain, the same iron benches and urns, the same statuary. Other postcards of Spencer Square exist, but they nearly always feature this outstanding fountain from one angle or another. Indeed this view of Spencer Square was so popular that the postcard was reprinted as late as 1947. 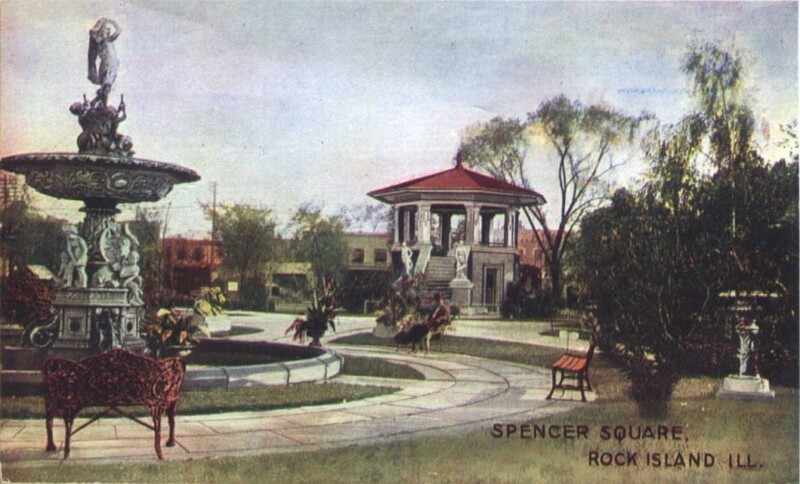 Spencer Square was always the jewel in the crown of Rock Island parks, thus it was a popular site for donations of beautiful artifacts. Judge Drury had given an “allegorical” 9-foot tall stag for the grand opening in 1890. The stag was installed facing into the park from near 20th Street. Two years later O. J. Dimick gave a granite statue of Black Hawk, which was placed between the stag and the center of the park. In 1902, it was reported that Springfield, Ohio based Home & Flowers magazine praised the park, calling it one of the most beautiful downtown parks in the nation. Little changed during the first quarter of the 20th Century. In 1925, a new “white way” lighting system was proposed to ring the outside of the square improving the light level within, which was provided by several simple iron standards along the interior walkways. Mr. Horn recommended the bandstand be removed completely, since it wasn’t large enough for a sizeable band. The randomly placed iron benches should be removed as well and replaced with concrete seats. The stag should be moved to a wooded setting, like the one on Stag Hill in Long View Park. The log house (the first time we heard about a log house) should be put where children may enjoy it. The Gettysburg tablet should be placed in Lincoln Park, and the Black Hawk Statue should be placed in Searstown. We don’t think many of these recommendations were immediately implemented, yet most of the items mentioned are nowhere to be found. A late 1930s photo shows the statuary at the base of the fountain missing, as are the iron arches that had stood at the corner entrances. Yet in 1927, the land, buildings, decorative items, and other improvements within Spencer Square had been valued at $158,000. In contrast, similar valuation of the much larger Long View and Lincoln Parks was $368,000 and $85,000, respectively. The public was appalled and John H. Hauberg spoke for many in an eloquent defense of the square. He proclaimed that conserving and enhancing the beauty spots of a city is as much the duty of the Chamber of Commerce as it is to induce industry to move here. The City Council supported this stance by voting the proposal down. In June 1953, Mayor Carl Bauer announced that a proposed 174 car parking lot in a portion of Spencer Square would not be carried out until he federal government completed the condemnation of the square. It’s not at all clear why the federal government would meddle in such local park affairs. Needless to say, the post office won and Spencer Square lost. We lost too. For decades, until the construction of Schwiebert Park in 2011, there was no public green space downtown, even though the resident population there increased dramatically. Some of the decorative items from the square were moved to other parks. The Black Hawk statue now looks over the Rock River valley from the historic Watchtower. There were lions at Long View Park but they were not from the square. (Those lions, which were crumbling, have since been replaced.) Some of the iron urns may be recognizable in Long View, but Long View was well stocked with urns and fountains on its own and didn’t really need more. A bronze eagle that had been donated by arsenal workers in 1891 and was mounted on a column in the square was reported to be stored in the basement of the city’s garage on Mill Street in the early 1960s. There was an old city garage on Mill Street that was demolished years ago – but it didn’t have a basement. Is the eagle still around? We are trying to find out. Readers – please tell us what you might know about the existence of the Spencer Square eagle. This article by Diane Oestreich is slightly modified from the original, which appeared in the Rock Island Argus and Moline Dispatch on February 23, 2003.